The Crusaders condemned the Wellington Hurricanes to another forgettable trip to Christchurch on Saturday with a 38-22 hiding to claim their second win of the Super Rugby season. Having survived a big scare away to the Blues in their season-opener in Auckland, the double defending champions were back to their marauding best at their home base where they belted the Hurricanes 30-12 in last year's semi-finals. Lock Scott Barrett and first five-eighth Richie Mo'unga each scored a brace of tries, with flanker Jordan Taufua and winger George Bridge also crossing. Winger Ben Lam scored two tries for the Hurricanes, with Wes Goosen and TJ Perenara also grabbing consolation tries deep in the second half after the visitors went to the halftime break 24-0 down. "Last week we spent most of the game defending... The first half (here) we came out with an attitude to attack," Crusaders captain Matt Todd said after the side sealed their 17th successive win. "We were able to score some good tries which was pleasing... We didn't really get the flow in the second half but we'll take a win like that and move forward." 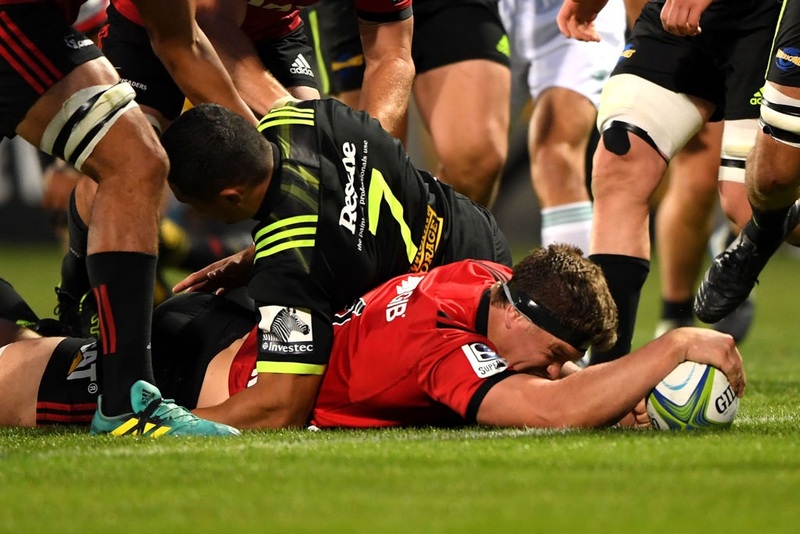 The Crusaders took their foot off the pedal in the second period and the final score flattered the Hurricanes who were without rested All Blacks flyhalf Beauden Barrett for a second successive week. His replacement Fletcher Smith was unable to spark a backline that had little space to work in a torrid opening half. A second half injury to Manasa Mataele was the only major fly in the ointment for Scott Robertson's Crusaders, with the winger taken off the ground with a leg problem after falling awkwardly in a tackle. Mo'unga did his bid to dislodge Barrett from the All Blacks' starting number 10 jersey no harm with his two first-half tries. His first in the 24th minute was set up by a brilliant off-load from Mataele who was off balance and rolling toward the touch-line in a tackle but lifted his feet just in time to keep the play alive as he released the ball. The Hurricanes were 31-0 down three minutes after the break when Scott Barrett, the younger brother of Beauden, grabbed his second try. The visitors finally scored in the 48th minute when Lam shrugged off three tackles on a breathtaking dash down the left wing before taking the ball from a ruck on the line and quickly planting it over. Lam capped a fine individual performance with his second try in the 80th minute, finishing off a quick counter-attack sparked by an explosive line break and sprint by replacement Jackson Garden-Bachop from deep in defence. Perenara gave the Hurricanes further momentum to take into next week's home match against Australia's ACT Brumbies with the team's fourth try, the replacement half-back taking the ball from a try-line ruck and planting it at the left post two minutes after the final siren.